This blog contains affiliate links. It is not a substitute for up to date information from relevant government authorities. A comprehensive Guide to visiting Kakadu in the Wet Season with photos, itineraries and ideas on where to stay and what to do. The Kakadu wet season runs from approximately November to mid April but varies each year. Kakadu is a vast, beautiful place and at 20,000sq km it is Australia’s largest national park. The most popular time to visit is the dry season where the temperatures are more comfortable and the wildlife more concentrated in the refuge of permanent Billabongs. However there is something magic about visiting in the wet season when water falls in abundance and pounds over the waterfalls before filling the floodplains and turning vegetation green and lush. Wet season is when Kakadu is most wild. There are other upsides to visiting Kakadu in the much quieter ‘wet season’ which runs from approximately November – May*. You can use this guide is to help you plan your wet season trip, combining activities from the itineraries below that suit your travel style. What is it like to visit Kakadu in the wet season? 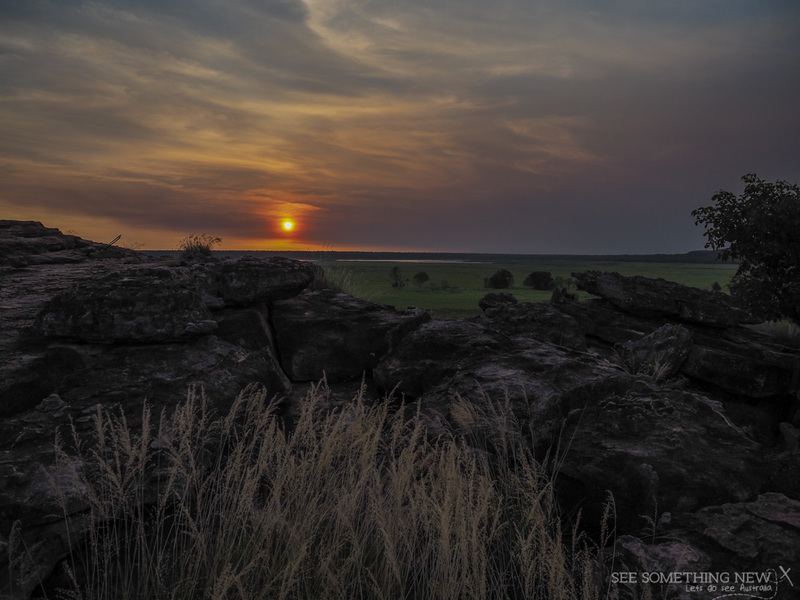 Kakadu is a different park in each season and even changes over the course of just a few weeks, with area’s flooding or drying out, flowers blooming and disappearing and new birds arriving. For this reason many people dream of seeing Kakadu in both the the wet and the dry to see how it changes throughout the year (or maybe that’s just nerds like me)! In fact the last month or so of the wet season may just be the perfect time to visit. There are still fewer other tourists around but the swimming holes are starting to open for the season and the waterfalls still have water. 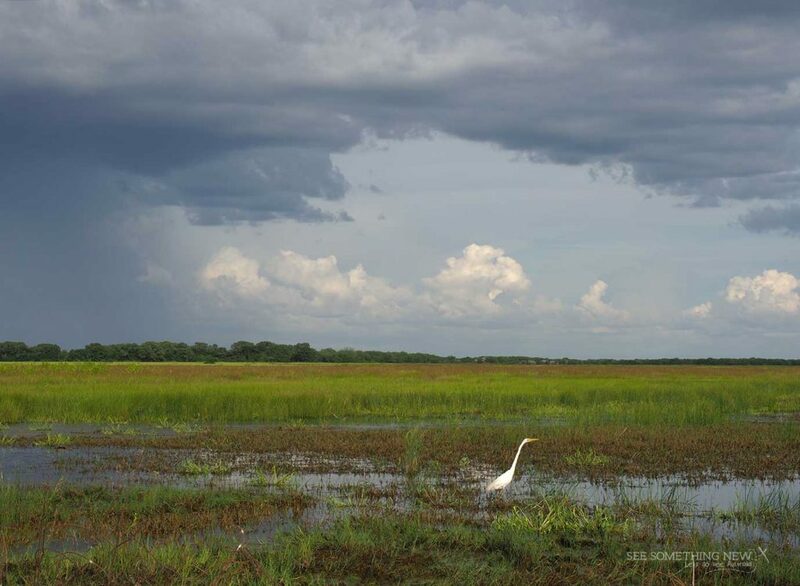 An Egret hunts for food in the floodplains of the South Alligator River, Kakadu. You can get much cheaper rates in the wet season (nearly half the price in some cases) which may make a trip you may not otherwise be able to afford fit into your budget. In the wet season water is far more abundant and floodplains fill up, vegetation is green and lush, water pounds over waterfalls (most are only viewed from the air until the waterfalls open late in wet season/early dry season) and wildlife will spread out across the vast areas of the park as they take advantage of abundant resources. In some ways you have to work a bit harder to see wildlife like crocodiles but temporary billabongs flood on the roadside making it easy to spot birds.You also get to see the landscape from a totally different perspective to those that visit in the dry. In addition the park is much quieter which means you will often have walks to yourself and share the hotels or campgrounds with fewer people. If your visiting from overseas you may visit Kakadu in the wet season as summer is the best time to visit Australia for sunny weather in the southern states. There is no getting around the fact that a lot of Kakadu is closed in the middle of the wet season. The big waterfalls like Jim Jim and Twin are shut as are most of the billabong walks and the #instafamous Gunlom are closed to the public, as is Ubirr, although it can still be visited on a tour. HOWEVER regardless of the time of year, In truth most many people who visit Kakadu do so for just a few days and do many of the same activities that are open in the wet season. This means unless you plan on doing extensive walking you will likely be able to find plenty to do in Kakadu in the wet season. I spent two months working in Kakadu towards the end of the wet season and I still didn’t see everything I wanted to. There was always something new to explore or somewhere amazing to go back to and see again. People who prefer just a few short walks will likely find 2-3 days is enough this time of year. I you can do longer or regular bush walks and are happy to pay for guided activities and tours you may like a bit longer such as 4-8 days. If you are happy to do long day walks (eg.12km) you will easily fill 8 days in Kakadu even in the wet season. If you want to stay for over a week or two and explore with lots of bushwalking then aim for the dry season or the end of wet season as even more walks open up. If you only have a few days and this is the only time of year you can visit then the wet season is still a great time to see what makes Kakadu special. in the top end there are two general seasons the ‘wet season’ running from approximately November to April/May and the dry from approximately June to October. The end of the dry season the ‘build up’ starts with relentless humidity before the rain arrives. Throughout the wet season the weather is humid, hot and sticky (think 36 degrees and over 80% humidity) and you may encounter anything from light rain to a relentless monsoonal downpour! The Indigenous people in the park recognise 6 more distinct season which you can learn about in the cultural centre. Their seasons recognise the more subtle changes throughout the year. Most people will find it very uncomfortable to sleep in a tent in this weather unless you are used to it. I stayed in a tent for 6 days in late March and was stifling, so an air-conditioned camper-van or hotel accommodation is a more a comfortable option. For credible up to date weather information refer to the Bureau of Meteorology website. You need to set your expectations for the trip and know that while you may luck on warm sunny weather, there is a higher chance of lots of rain for part or all of the day so come prepared for this option so you still enjoy your trip. You also need to be aware that conditions in Kakadu are very seasonal and access to roads and walks may vary from week to week as well as by season. Be prepared to go with the flow and explore the areas open when you visit. While it doesn’t happen often, there is the chance that even main roads may flood during these times cutting of access to and from Darwin and that lightning storms may prevent tours from running – but that’s the risk you take going to see wild Kakadu at its wet season best. Parks Australia posts a daily road report so you can check up to date road access information prior to travel. WAIT don’t skip this, it’s important and I’ll be quick, I promise. It’s important to always check road reports prior to travelling in the wet season. You also need to check up to date safety information about access and swimming with reliable government source prior to travelling. The rule in Kakadu is unless it’s a tiled swimming pool assume it is NOT safe to swim due to crocodiles. In some areas the government manages Crocodiles and there are low risk crocodile areas above waterfalls once surveying has been completed however a crocodile can move into an area at any time. ALWAYS check with the visitor information centre before swimming anywhere in Kakadu (or the top end for that matter) for the most up to date swimming safety information. While the speed limit may sometimes be 110 – 130 use your judgement on going this fast. There are lots of animals on the road including very large buffalo, especially at night time. Also, it’s a national park and unfortunately if you go at a higher speed it’s near on impossible to avoid hitting birds and other animals at night time and killing an animal is never a nice way to finish a special day. If you must drive at night, slow right down to a speed where you can stop safely if you need to – there is few others on the road so you’re not holding up traffic. In 6 weeks in Kakadu I had to stop at night for buffalo, a pig, several donkeys, a kangaroo, many wallabies and literally hundreds of birds – hitting any large animal is just not a safe option. These two things actually kill more people in Kakadu than crocodiles so make sensible decisions. If you start to feel like you have symptoms of heat illness stop immediately in the shade and rest then turn back. Carry a litre of water per person per hour of walking – it’s better to carry an extra kg than run out of water mid-way through the walk. Also walk early in the day, especially for escarpment walks as the hot rocks and lack of shade make it very hot. Always have water with you in the car and even on cruise, just the humid air will dehydrate your quickly! There is no mobile phone reception in many sections of the park. Telstra seems to have the best coverage and I found I had reception within about a 20 minute radius of Jabiru and 10 minutes or so of Cooinda Lodge. I had limited or no coverage outside of these areas and it will depend on your provider on if you have phone reception anywhere in the park at all. Parks does provide a number of emergency call devices near popular walks. For all safety information including crocodiles, boating, bushwalking etc visit the Parks Australia website. You must purchase a park pass for the duration of your visit to the park you can buy them online before you go or at roadhouses on the way. The money from your pass goes 100% back into managing the park (track maintenance, weed & feral animal control, fire management, interpretive signage, administration, ranger guided activities and ranger presence across the park etc) and to the traditional owners who call Kakadu home and generously welcome visitors. You can see a breakdown of where the money is spent at the visitors centre. Because Kakadu is such a big Park it is divided into 7 ‘regions’ and this is how Parks Australia groups walks and campgrounds in the visitors guide. Some regions may be as much as several hours drive apart so you are best to do the walks in one region over the same or consecutive days while staying nearby. 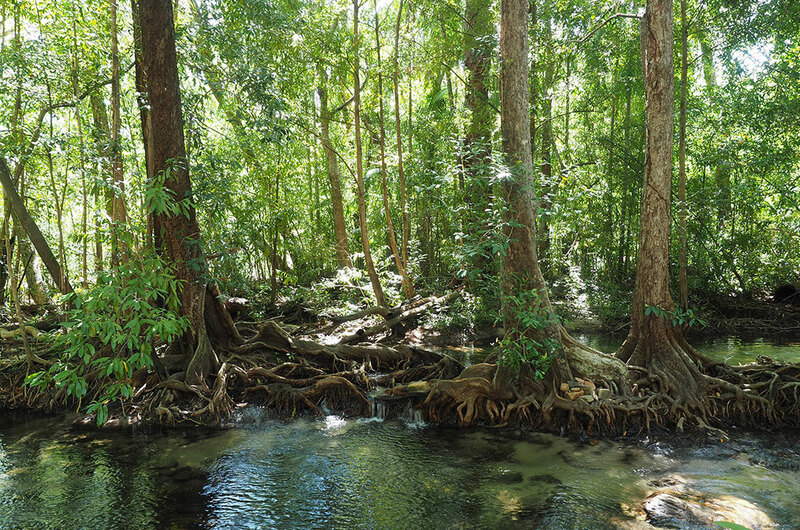 However in the wet season this is not as much of an issue, most of the walks that are open are in the Nourlangie Region about 20km south of Jabiru (25 minutes North of Cooinda). The rest of the walks are in the Mary River Region (not to be confused with Mary River National Park on the way to Darwin) which is about 1 hours drive south of Cooinda (or 1h45m south of Jabiru). There are also some ‘seasonal’ walks which are sprinkled around the park. These are generally open in shoulder season but may close for parts of the wet season or the bigger rain events. As previously mentioned the rest of the walks to waterfalls and billabongs are generally closed in the wet season. 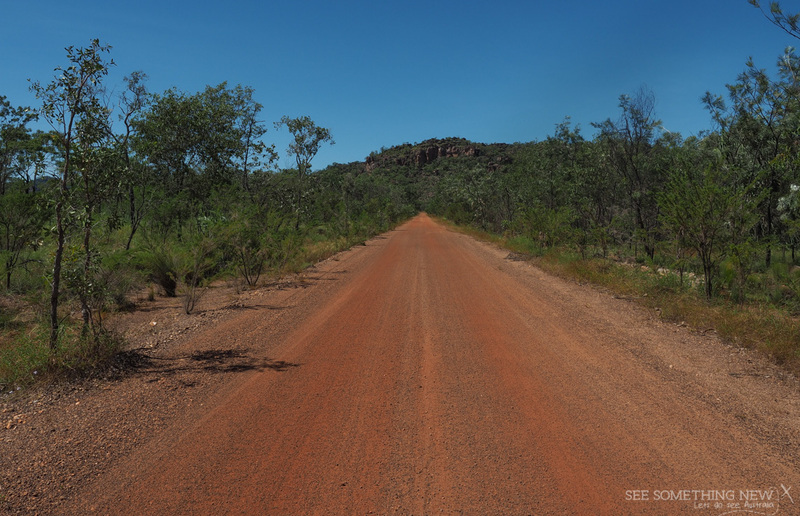 There are two main sealed roads in Kakadu. The Arnhem Hwy runs from West to East (approximately) across the Northern section of the park. The Kakadu Hwy runs from the Arnhem Highway in the North to the south exit towards the bottom of the park. The road to Border store is also sealed but closes during the wet, the two highways may have road closures in extreme rain events only. In the wet season places are either open to all vehicles or not at all so a 2wd will get you into most of the main activities. There are some open gravel roads that become 4wd only during some parts of the wet season (e.g. Yumikmik area). Once the roads dried out we were able to get a 2WD down the 2wd accessible tracks no worries, however lots of wet season damage to the road meant we needed to drive at a sensible slow speed. The road to Gubara Pools can be seasonally closed or restricted to 4wd for parts of the wet season. The benefit of a 4wd is you can access those gravel roads when they are 4WD only and in shoulder season some roads maybe open to 4WD only until water across the road recedes. This can included places you may really want to go like Ubirr (check rental car information in relation to water crossings)! There are several 4wd tracks in the park to reach the coast, the big waterfalls and to visit some Billabongs however these 4WD tracks close in the wet season due to flooding and it’s unlikely any of them will be open until the dry most years. So in conclusion, you won’t miss out on seeing most of the more popular places if you visit with a 2wd but a 4wd may give you access to more bushwalks at certain times in the wet season. If you don’t drive or would just prefer not to the best way to see Kakadu is on a pre-booked day trip or multi day tour. You will find you have very limited options of tours and places to visit without your own car or a pre-booked tour. There are several tour companies operating tours to the park that vary in length, inclusions and accommodation standards. AAT Kings offers a range of comfortable coach tours that include Kakadu as part of the Itinerary and Adventure Tours (part of the Intrepid Group) offer small group adventure tours. These are two of the most well-known tour companies specialising in Australian travel. There are also many smaller local companies that offer tours that visit Kakadu as part of their itinerary. All guides who work in Kakadu must complete a comprehensive ‘Kakadu Knowledge’ course to ensure they can competently and safely guide you around Kakadu National Park. Jabiru is the main service area in Kakadu National Park and was established as a mining tour that existed prior to the parks declaration. It has a service station, supermarket (open business hours, check them here), a bank, a post office, a doctors clinic and some other business that service the area. It’s a good place to refuel and get any groceries you need (be prepared for remote area prices). Just a short drive from Jabiru the Bowali Visitors Centre is a good place to visit early in your visit to kakadu. A café, Gallery and Free wifi the Bowali visitors centre is a definitely worth a visit. 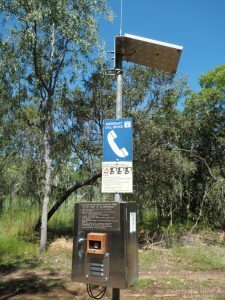 It is really well designed with many tactile displays for kids to touch (part of a full size ute sticks out of the wall) and lots of information on the ecosystems and wildlife in the park. Also allow some time to watch the docos in the theatre which give you insight into the park and the amazing team or rangers that work there. Choosing where to stay in Kakadu in the Wet Season can be a bit confusing given it is Australia’s largest National Park. If you are only staying a night or two and would like to do a dawn or dusk cruise with Yellow Waters (which I highly recommend) it is most practical to stay at Cooinda Lodge. This way you avoid driving at night and you can visit the Nourlangie region during the day. If you like a comfortable 4 star hotel and are not willing to compromise on this base yourself at the Mecure Crocodile in Jabiru. Remember all the hotels in the Park are considered very remote and don’t have the ability to offer all the same standards or services as luxury hotels in the city. 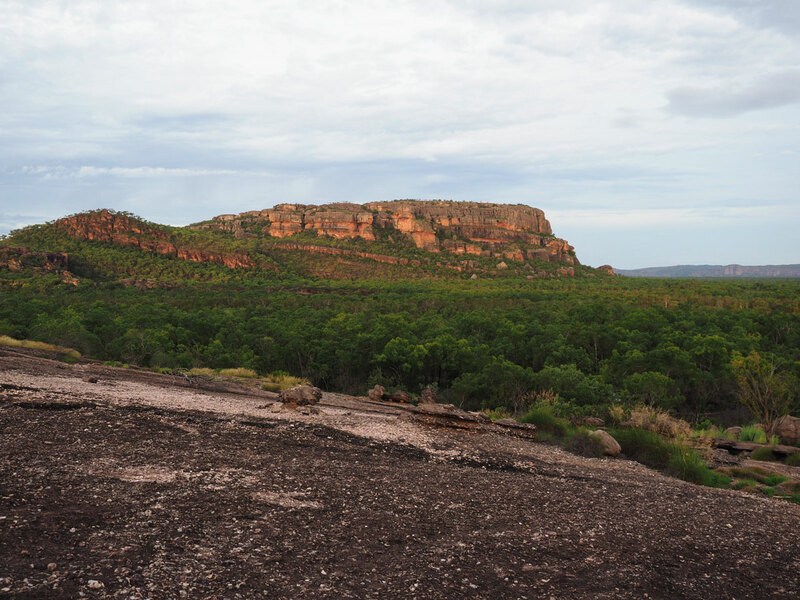 If you are visiting for longer, spread your time out over the different areas of the park (Cooinda, Jabiru, Mary River) to spend less time driving and more time bushwalking in the regions. Jabiru is the most popular place to stay in Kakadu and is a good central location for those who would prefer to have access to small shopping facilities during the day (a supermarket, post office and service station and an international standard hotel. There is a range of accommodation and camping options available in the town. It is also a good base for accessing tours and the Nourglangie Region bushwalks as well as the flat walk to the visitors centre and the Visitors Centre itself. A remote equivalent of a four star hotel, The Mecure Crocodile Hotel has an excellent restaurant, pool and gallery of local Indigenous Art. The hotel is most famous for its quirky crocodile shaped design which is best viewed by aerial photo. The hotel is managed by Accor on behalf of Kakadu Tourism and offers Accor Plus members food and beverage discounts. Anbinik is a 3.5 star alternative that offers a range of comfortable hotel and self contained bush bungalows in a manicured bush setting in town. Both of these hotels are Indigenous owned so when you stay in these resorts you support Indigenous business and the creation of remote area jobs. Aurora Kakadu offers limited budget accommodation options a short distance from the town centre as well as a huge campground with a fun poolside restaurant bar and big shady swimming pool. The 2.5 star Cooinda Lodge is the only accommodation in this area and is a great base for those who are doing dusk and dawn Yellow Water cruises. It has a bush campground and a beautiful lagoon pool which is a nice place to cool down after bush walking. If you don’t want to move around it’s a good central base for both the Nourlangie and Mary River regions. Cooinda is also close to the beautifully designed cultural centre where you can learn about the Indigenous culture of the regions. Mary River Roadhouse a few hundred metres from the Southern Entrance to the Park. It has budget accommodation options available, a campground and a small outback bar with outdoor tables that offer a nice view of the sun setting over the trees. It is conventiently located to access the walks in the Yumikmik area. Aurora Kakadu hotel is located towards the western entrance of the park so its not the most central location for for poplar activities in Kakadu in the wet season. However it is a very popular option for those fishing the South Alligator River as it is just a few km from the boat ramp. It is also be a good base for exploring the western 4WD tracks when they are open in the drier months. Many of the campgrounds in Kakadu are shut in the wet season due to flooding and their proximity to large flooded rivers (where large crocodiles live!) however there are still plenty of managed and budget campsites open all year round. The best place for information on where to camp is the Kakadu Visitor Guide as it gives you details on what facilities are available at each campsite. The Kakadu Roads Report also includes up to date information on which campgrounds are open and is updated daily. Cooinda Lodge has a campground otherwise the bush alternative is the lovely natural ‘Mardugal Two’ campground. It is a beautiful bush campground with showers and toilets. Camp fees apply to this managed area. It’s the first campground on the right on the way into Mardugal Camp area. Choose from a huge range of sites tucked away in the Pandanus bush. Gunungural is a basic bush camping area with drop toilets in the Mary River Region just a few km’s off the highway. It has tent and van accessible sites. In the evening the sun sets over the long grass of the floodplains in the lower area of the campground making a nice way to finish the day. Gunlom is not a wet season campground but does open up towards the end of the wet once road access permits. It’s an open grass managed campground a short stroll from the stunning Gunlom Falls. People swim in the lower falls however crocodiles have been found in there before and parks advises they can move into the swimming area at any time. This campground also as access to the walk to the top pools at Gunlom where you can float around in the insta famous natural infinity pool at the top. For camping information in the other areas of Kakadu check the visitors guide. Yellow Water Cruises operate daily year round except for on the very few occasions unsafe weather or access prevents them from running. They depart from near Cooinda Lodge or the lodge itself in bigger wet seasons. The best tours for spotting wildlife and getting the iconic landscape photos of the billabongs are dawn and dusk. Alternatively the shorter day tours are good for those with small children or with limited time. In the dry and shoulder season (including the start and end of the wet season) Kakadu tourism offers day trips into the heart of the park. They pick up from Cooinda as well as Jabiru hotels and take you to explore various waterfalls and walks around the park, access dependent. These tours are best for those with a higher level of fitness who can walk 10km or more in a day. Book both your cruise or/or day trip with Kakadu Tourism, the Indigenous owned company that runs the tours. Kakadu Cultural Tours is another Indigenous tour company which operates primarily in the north of the park. In the wet season you can visit Ubirr with the Gulyumbi Wet Season Tour and learn about Indigenous culture from the north of the park. I unfortunately never got a chance to go on the tour but my parents did later this year and to quote my mum ‘it was fabulous’ ;). Their rating on trip advisor backs up this review with their cruises consistently getting 5 star reviews. This is a guide to what is genenerally open but don’t forget that conditions can change quickly in the wet season. The walks in this region traverse a mix of lowland savannah woodlands, monsoon forest & sandstone escarpment and is a great area for wet season bushwalks. 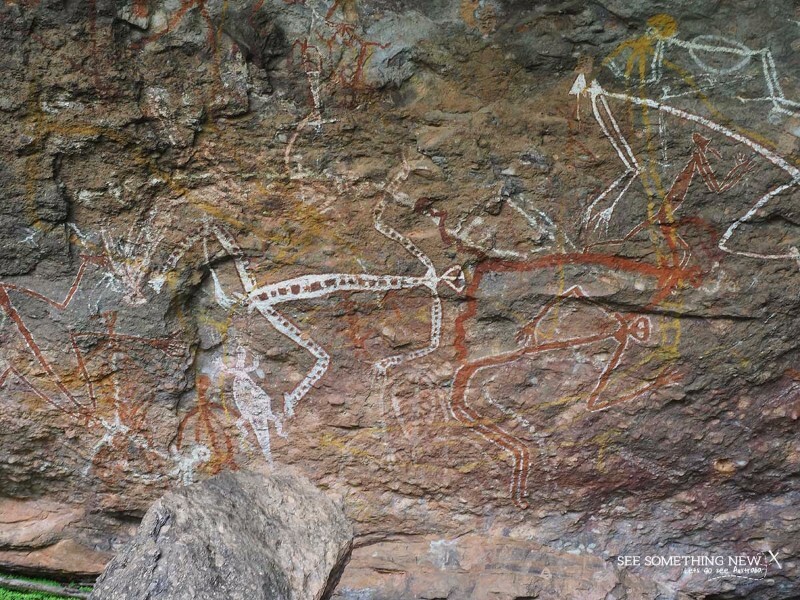 A short 1.7km loop, the Nourlangie Art Walk takes you past ancient art and a cave that was frequently used by Indigenous people in the Kakadu region. The full loop includes some moderate uphill climbs but there is the option to do it as a return one way walk along a flat path to a wheelchair accessible gallery at the end. A short walk of just 300 metres, Nawurlandja is a steep climb up the side of an angled rock face to a viewing point part way up. From this spot you can look over the Anbangbang Billabong and watch the Burrunggui (Nourlangie) escarpments change colour in the late afternoon sun. While not quiet as dramatic as Ubirr, Nawurlandja is a lot more peaceful and has beautiful views to farewell another Kakadu day. A flat walk through savannah woodland, past sandstone cliffs and finishing with some rock hopping to visit the pretty pools of water in rare Moonsoon forest. Not a swimming spot but a beautiful little ecocsystem to visit and enjoy. A lesser visited art site (because its harder to get to) this long overhang in the bush boasts art painted over a period of thousands of years. Take the printed guide to art in Kakadu to help interpret the age and meaning behind the different styles of art at this awe inspiring site. Also take plenty of water, hat and a sunscreen because there is not much shade on this walk until the art site area. For experienced bush walkers only this is a 12km beast of a walk through sandstone country. You need to start at the crack of dawn so your walking in the cooler parts of the day. I have not completed this walk myself as my fitness levels were not up to scratch. The wet season walks that are seasonally open are predominantly in the Yurmikmik area. The signage in this section is atrocious so be sure to take the Yurmikmik region park notes with you. A short walk to a pretty little waterfall with a path to explore the pool at the top (never go near the edge of any waterfall, ever. Your endangering yourself but most importantly those who have to come rescue you). The most accessible water fall for much of the wet season is Motor Car falls. This lovely watefall is tucked away in a little gorge a 7.5km return walk from the carpark. Bushwalk through lowland woodland and past sandstone escarpments before some rock hopping to get into the falls itself. At the waterfalls there is a nice big rock which when accessible is a good place for a lunch stop and to relax and enjoy the peaceful gorge. There is very little shade on this walk so where a wide brim hat and walk early in the day to avoid the heat. You can do the Yurmikmik Lookout Walk as a side track from this bushwalk and experienced bush-walkers may like the overnight Kurrundie Creek walk. There is an unmarked track to a waterfall in this region, chat to a local at the Mary River roadhouse or the Visitor centre for instructions on how to find it! One of the best parts of the drive through the south of Kakadu is the incredible termite mounds which are higher than your car! An easy flat walk through lowland woodland and over a small creek with Pandus this is a nice little walk to spot woodland bird species on your way to the centre. Somewhat wheelchair accessible ( probably best for offroad electric chairs, you need to get around bike bollards at the creek and there are sections of the path that are damaged) and easily ridden on a bike its good way to start or end the day. Keep an eye out for brightly coloured finch in the pandanus around the little creek which runs through much of the wet season. Its also a great spot to see an abundance or wildflowers if you luck on the right time of year. I was there in early May in a year of a big wet season (2017) and there was wildflowers galore. There so much variation in wet seasons it’s hard to know what to include in this section! There are some walks that won’t open to the height of the wet season but the ones below generally open at some point prior to what’s typically thought of as dry season. This walk may open up in the late wet seasonwas an absolute highlight of Kakadu for me! Read about why I have no photos of Gunlom here. By far the most humbling sunset experience of my life, sunset over Ubirr is on a lot of Aussie bucket lists for good reason. The landscape around this region feels so prehistoric you expect to see dinosaurs or mega fauna wandering around. Visit at the very start of the Ubirr season when the water has just receded to see the sunset over vibrant green floodplains. The ecosystems in Kakadu are constantly changing with the seasons which means different species are abundant at each time of the year. Often spotted grazing in the grass on the roadsides the Agile wallaby is one of the most common mammels in the top end. Spotted along the roadsides frequently at dawn and dusk so make sure you take it easy while driving at this time. 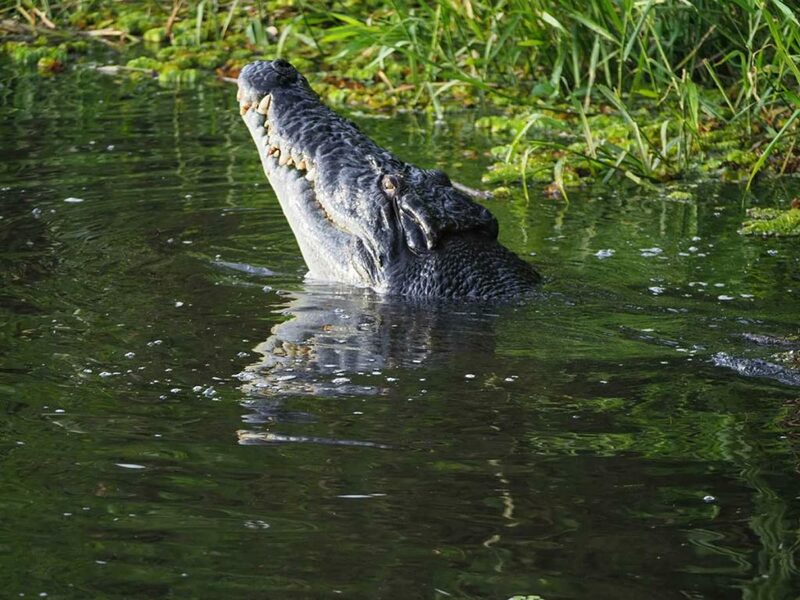 Estuarine Crocodiles are commonly called Saltwer Crocs however it’s a misnomer that they won’t live in freshwater. Prolific in the waterways of Kakadu National Park, in the wet season they spread out over the vast floodplains and females lay their eggs. 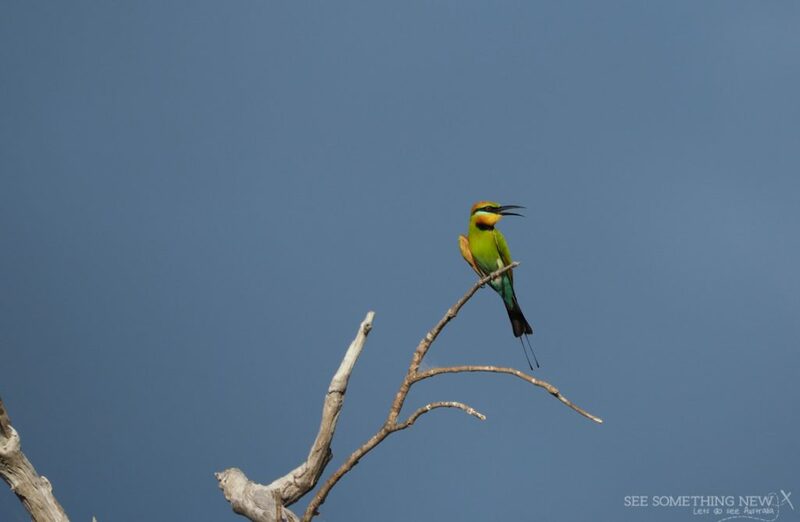 The best chance of spotting one in wet season is on the Yellow Waters Cruise. Once access is open to Cahills Crossing, the viewing platform there is also an excellent free spot to watch for crocodiles. 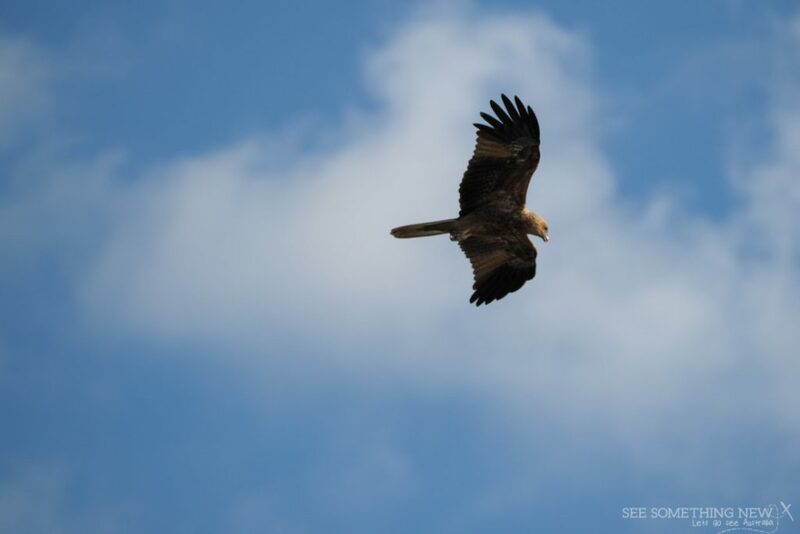 There are hundreds of whistling kites in Kakadu and being from down south where they are much rarer I was very excited to have a chance to see so many up close. In Kakadu some of the guides jokingly call them the seagulls of the North because of their numbers and they are known to steal food straight off the BBQ! My Favourite Bird Species, the Rainbow Bea Eater love water and can be spotted near water. You will find them along creeks and rivers on cruises and walks and even playing in puddles on the road. Kingfishers are another bird frequently spotted around water in Kakadu in the wet season. 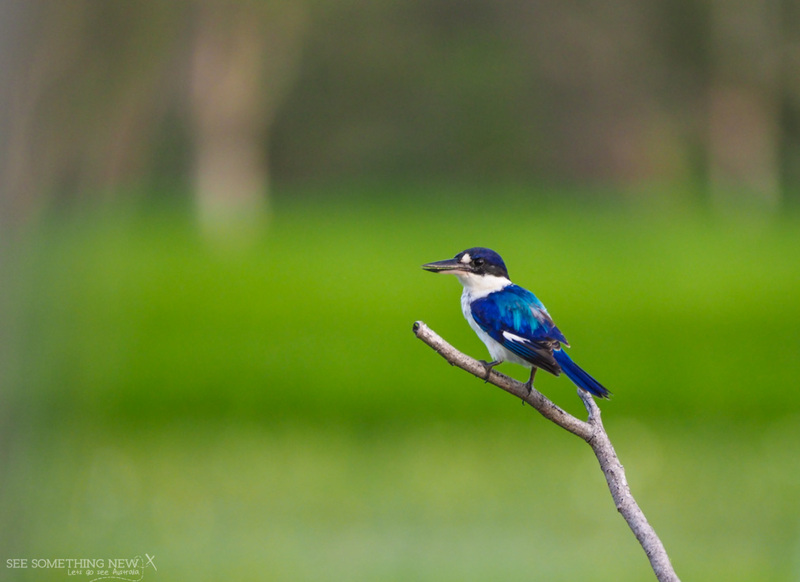 There are many different types of Kingfishers in Kakadu including the blue winged Kukaburra and Forrest Kingfisher. Most prolific in the dry season after breeding and when there numbers are concentrated in the billabongs however they are often spotted on cruises around the Yellow Water Region, even in the wet season. Look out for groups of 3, a lucky male bird with his two ladies he shares the nest with! Keep your eye out for lizards everywhere in the park from around the hotels and camprounds to perching on logs and rocks on the bushwalks. Dragons and skinks are some of the more common species spotted as well as geckos and members of the goanna family. Here is some Itinerary ideas to help you plan your trip! If you like to be busier or are fit and can do lots of walks in one day there are extended options included! These itineraries are based on arriving from the North West of the Park along the Arnhem Hwy from Darwin. If you are entering Kakadu from the south you will be doing activities prior to reaching Bowali Visitors centre. In this case make sure you download the Visitors Guide from the website before you arrive in Kakadu so you know all the important safety information. Also check the Kakadu road report prior to travelling so you know what is open in the park to visit. You can also read my quick guide to visiting Kakadu from the South. Parks Australia also has lots of recommend itineraries in their park guide. You should consider a tour instead of self drive if you only have 1 day to visit from darwin. This will mean someone else has to do the epic drive for you and everything is pre-booked to maximise you time in the park. AAT Kings has lots of 1 day tour options. Travel Darwin to Jabiru which is a drive time of 2h41m (253km) WITHOUT rest stops. You need to be ready to catch the shuttle or self drive to the dock to board 15 mins early when the regular dock is open. Travel Warradjan/Cooinda area to Darwin is 3h15m WITHOUT rest stops. 7.45pm Arrive back in Darwin (with some rest breaks along the way). Make sure you are allowed to drive your rental car in the dark and share the driving with someone to ensure you travel safely after a long day. Darwin to Kakadu Travel Darwin to Jabiru which is a drive time of 2h41m (253km) WITH OUT rest stops. There are a number of stops along the way between Darwin and Kakadu but if you only have 1 night you want to make the most of your time in Kakadu. The Windows on the Wetland is on the way. It is a free information centre run by NT Parks & Wildlife which has a nice lookout and some information on the surrounding floodplains. There is a picnic table near the carpark for breakfast with a view as incentive to get going early. If you are entering from the South of the Park make sure you download the visitors guide of the internet so you know how to stay safe in Kakadu. Nawurlandja Lookout Walk for sunset. The Bowali Visitors Centre is award winning with lots of information about the ecoystems in the park. There are knowledgeable staff at the information desk who can give you up to date details on what to do in Kakadu. The Nourlangie Walk is a 1.7km loop as well as wheelchair accessibility to 1 art site (done as a return walk). It has beautiful examples of Indigenous art from the region as well as views out over the Arnhem Escarpment. If you have plenty of time to make your cruise (arrived the night before or left Darwin VERY early) or are not cruising until the next morning there are longer walk options in this region. The 4km return Nanguluwurr is a much quieter art site (you may have it to yourself this time of year) with a big long gallery of art spanning across thousands of years. 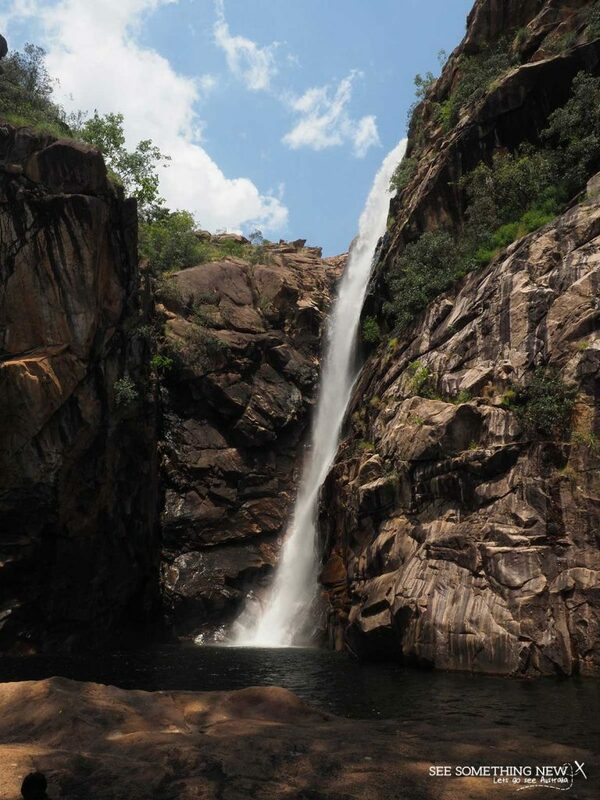 Alternatively visit the 6km return Gubara pools to see pretty monsoon forest and pictureqsue creeks and pools. Overnight Stay Stay at Cooinda Lodge & Campground or Mecure Crocodile Hotel Cooinda Lodge offers camping and 3 star accommodation in the bush and is very close to where the Yellow Water Cruises leave from. It is centrally located between the 3 main regions that have walks open in the heart of the wet season. The morning cruise is definitely worth getting out of bed for and they have an awesome deal 2nd cruise is about 65% off . If you would like to try your hand at fishing for Barramundi this is the place to do it! There is only 4-5 people on the boat and there is space to move around so it’s a good option. Why is this guide free? Because I love sharing my knowledge of Australian travel with you and I want to turn sharing this knowledge into a full time job! How can you support more free guides? Just enjoy it 🙂 But the best way to support See Something New developing these free guides (which take many many days several long days) is to simply book your accommodation through our affiliate link! When you book using this link the blog will get a small commission (generally a couple of dollars) at no extra cost to you. I personally use them because they have the largest online booking site in the world so you know you will get a lot of choice. You also have the option to book with free cancellation and no deposit for most hotel rooms. This means you can be assured of accommodation while you make sure you can get flights and other essentials. And if you ever need help with your booking. Booking.com has real people you can speak to on the phone and they are helpful, I have spoken with them before on one of my own bookings. Parks Australia has the most update to date information on whats on in the National Park. For information on Yellow Waters Cruises you can visit the Kakadu Tourism website to book. Thankyou so much for reading to the end an allowing me to share the beautiful Kakadu with you. 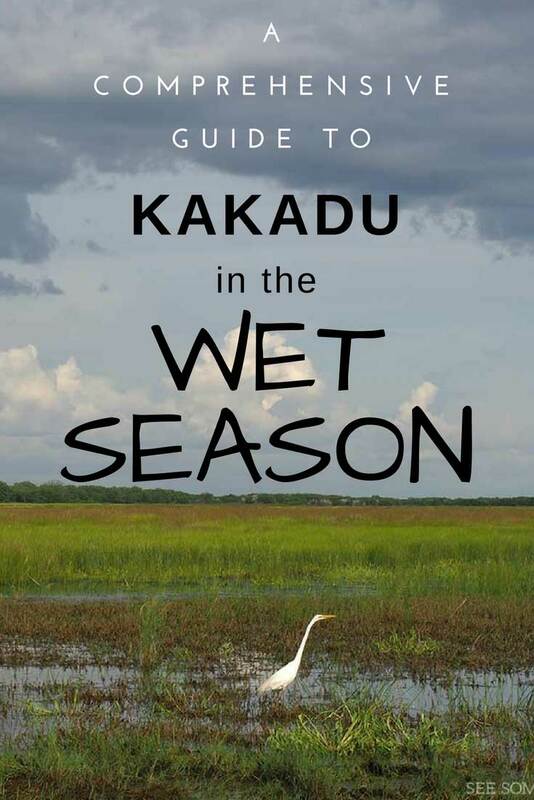 A 7000 word guide to the wild and beautiful wet season in Kakadu National Park. If you found the information in this guide helpful I encourage you to share it so others can find it to.